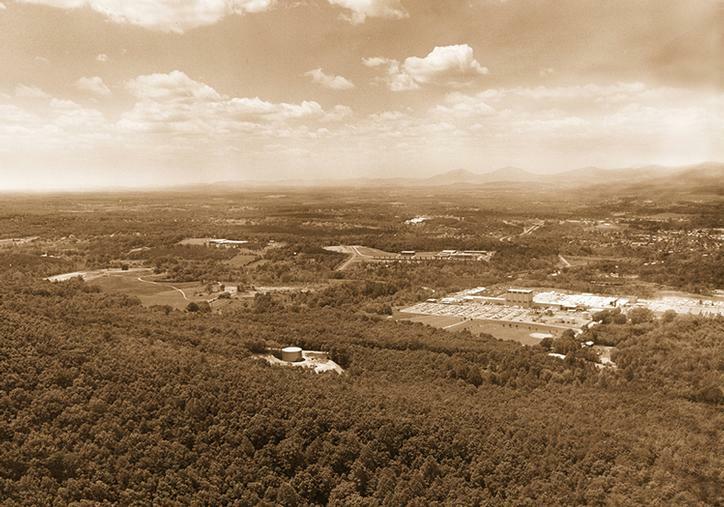 AERIAL OF CAMPUS | In 1972, Dr. Jerry Falwell walked through the woods of Liberty Mountain praying that the Lord would make it available to build an institution of higher learning with the sole purpose of training champions for Christ. 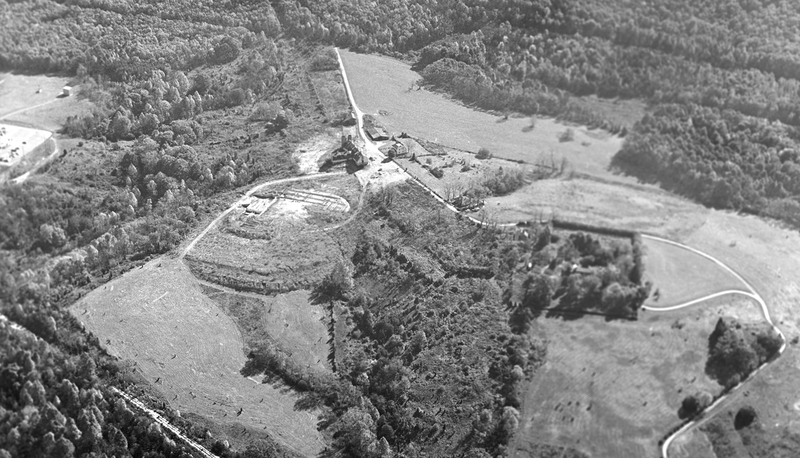 This aerial view shows the area that would become the Liberty Baptist College campus. Photographed in May 1977. AERIAL OF CAMPUS | Photographed in May 2018. 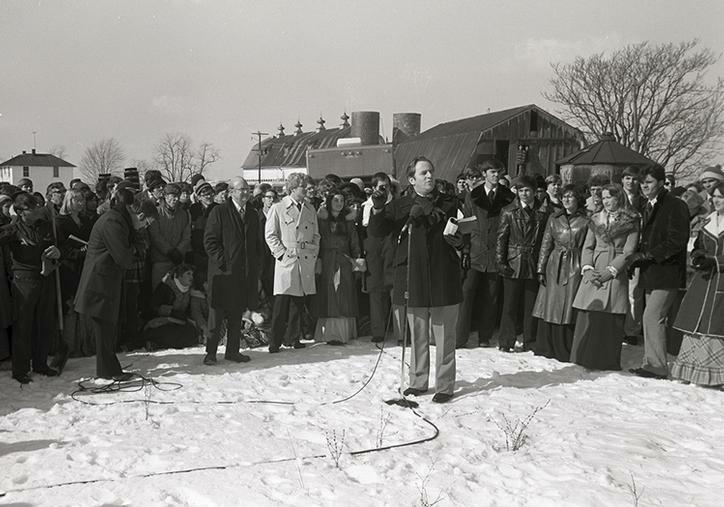 PRAYER MEETING FOR CAMPUS CONSTRUCTION | Dr. Jerry Falwell, Sr. prays with students, faculty, and administrators on Jan. 21, 1977. The facility they had been using for classes was scheduled for demolition at the end of the semester. The group prayed in eight inches of snow for nearly two hours, asking God for financial stability and a place to call home. 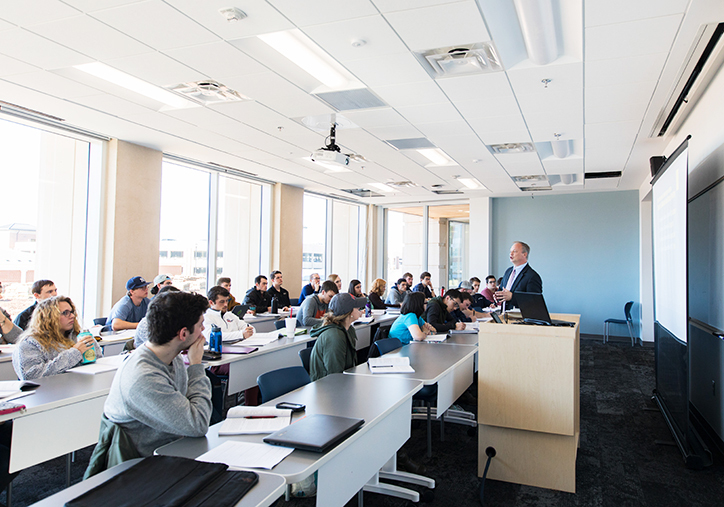 Miraculously, in only seven months, students entered two new classroom buildings as well as new residence halls on Liberty Mountain. ANSWERED PRAYERS | More than 40 years later, students enjoy the answered prayers of their predecessors while during a snowy day on campus. 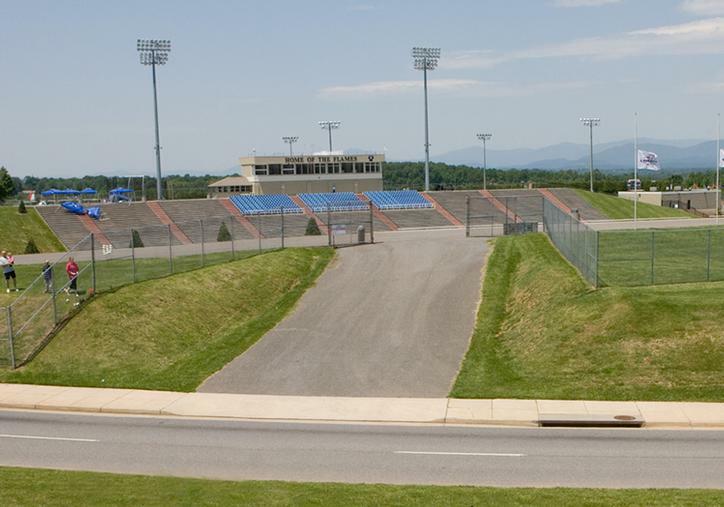 WILLIAMS STADIUM | Photographed in May 2007. 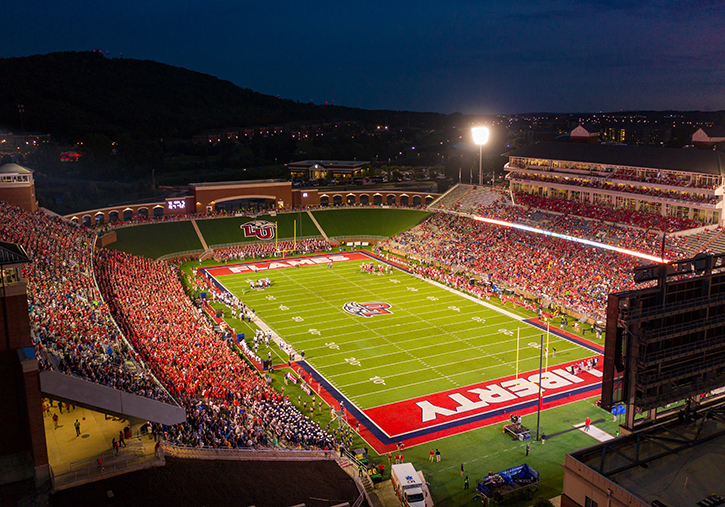 WILLIAMS STADIUM | The expanded Williams Stadium features a five-story football tower complete with 18 luxury suites and a fully-functional media center. Photographed in September 2018. FLAMES FOOTBALL | Members of the Liberty Baptist College (LBC) Flames Football team take the field at Lynchburg Municipal Stadium. Photographed in November 1979. 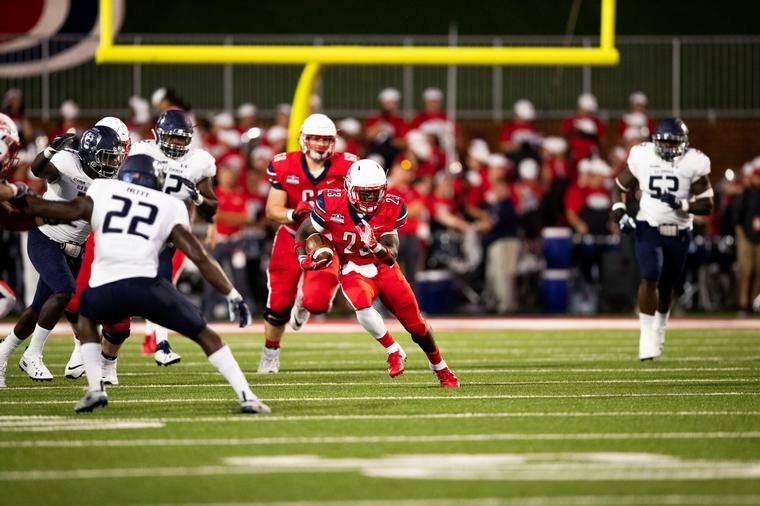 FLAMES FOOTBALL | The Flames take on Old Dominion for their Homecoming game and get their first win as an FBS team. Photographed in September 2018. 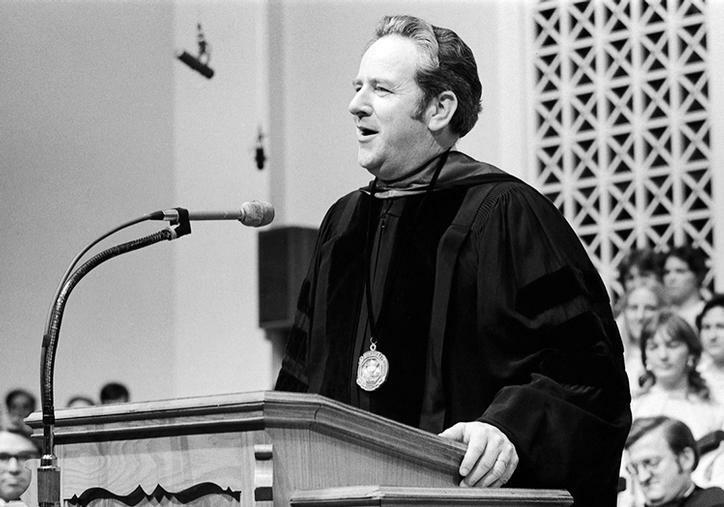 JERRY FALWELL, SR. | President Jerry Falwell, Sr. speaks at Liberty Baptist College Graduation. Photographed in May 1977. JERRY FALWELL, JR. | President Jerry Falwell, Jr. speaks at Liberty University's Commencement. Photographed in May 2017. 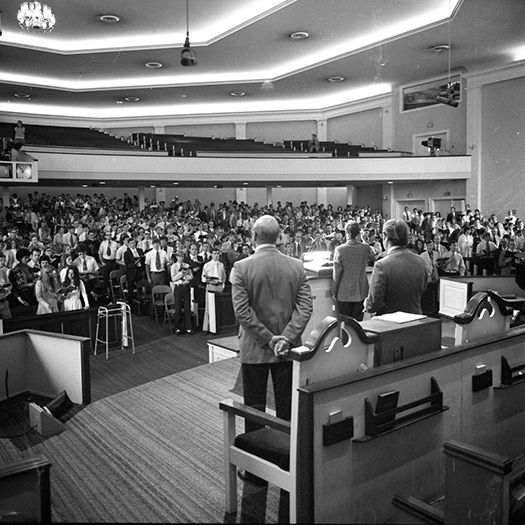 COMMENCEMENT | Lynchburg Baptist College conducts its first Commencement ceremony in the main sanctuary of the original Thomas Road Baptist Church on May 22, 1974. COMMENCEMENT | Visitors fill Williams Stadium for Commencement on May 18, 2018, while President Jimmy Carter delivers the Commencement address. FLAMES BASKETBALL | The Lynchburg Baptist College Men's Basketball team plays at Jefferson Forest High School. Photographed in January 1976. 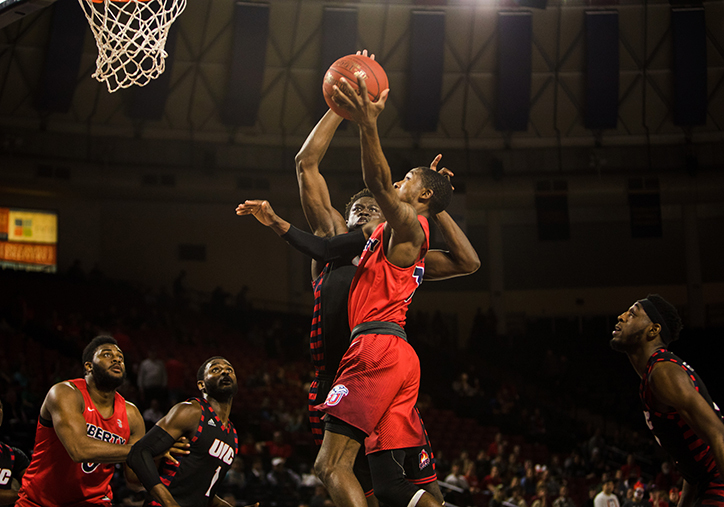 FLAMES BASKETBALL | Liberty University Men's Basketball vs. UIC during CIT semifinals. Photographed in March 2018. CONVOCATION | A 3,000-seat tent was erected at Liberty Baptist College (LBC) because no facility on campus could house the rapidly growing student body. Construction was under way on the classroom complex. Students continued to attend Convocation in the tent through the cold, winter months. A heater was brought in to make the hour more comfortable and students brought their own blankets to keep warm. Photographed in September 1978. 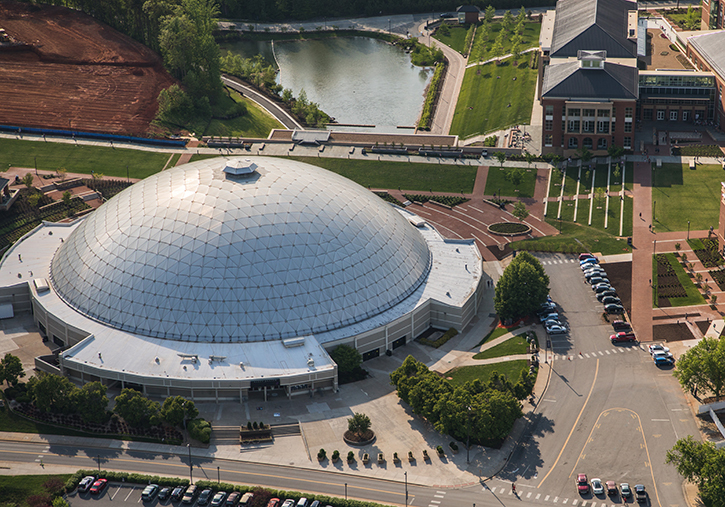 CONVOCATION | The Vines Center is a domed arena used to host Convocation, concerts, church services, conferences, and sporting events. 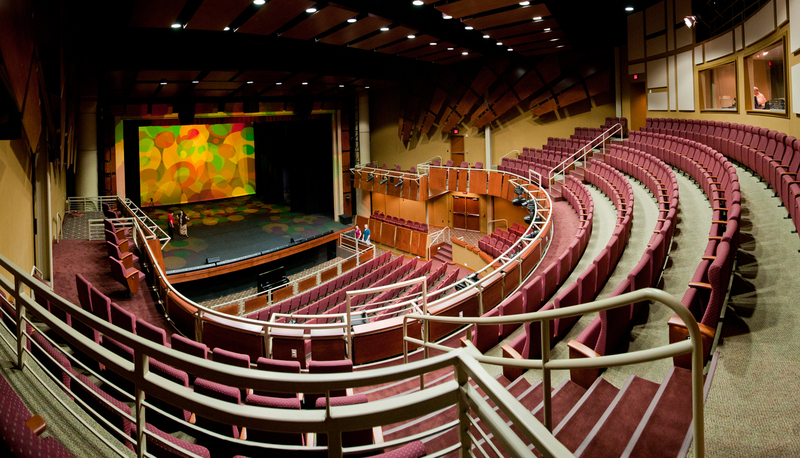 It has a seating capacity of over 10,000. Photographed in May 2018. CONVOCATION | Chapel services were conducted during the opening week of classes in the main sanctuary of the original Thomas Road Baptist Church. Photographed in 1975. CONVOCATION | Students gather in the Vines Center for Convocation. Photographed in October 2018. 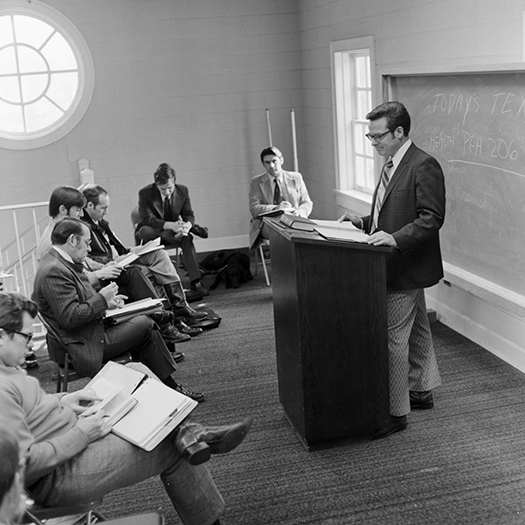 CLASSROOM | Dr. Carl Diemer conducts class in the upstairs lobby of the original Thomas Road Baptist Church. 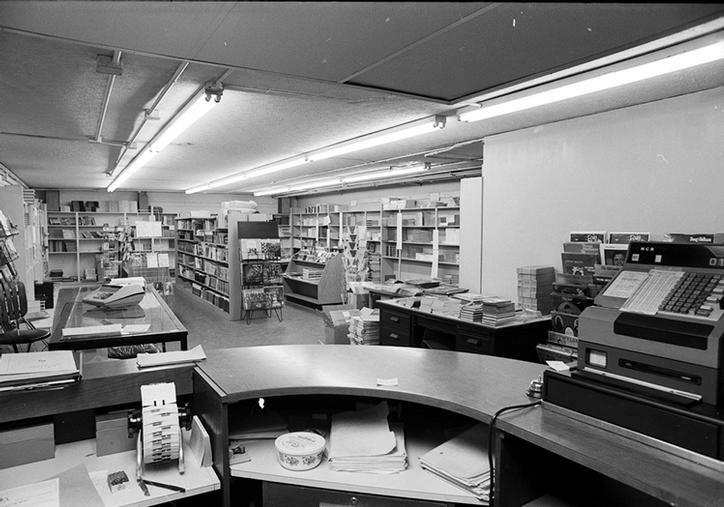 Photographed in January 1975. CLASSROOM | Liberty students benefit from technological learning resources in the classroom. Photographed in February 2018. 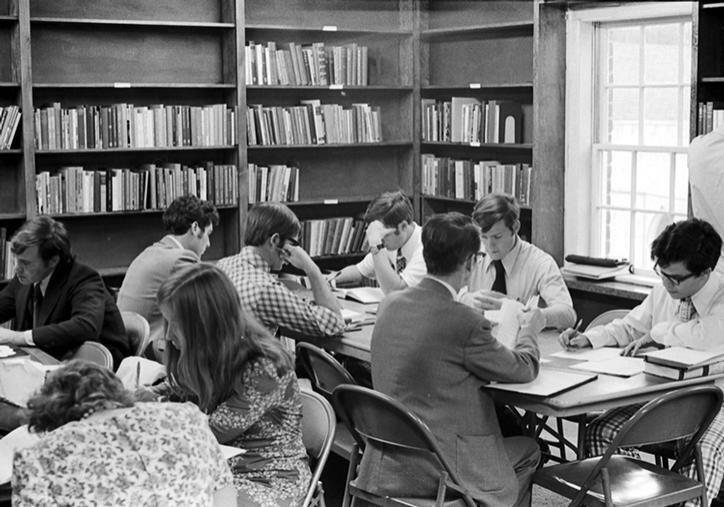 LIBRARY | Students study in the library of Lynchburg Baptist College. Photographed in 1975. 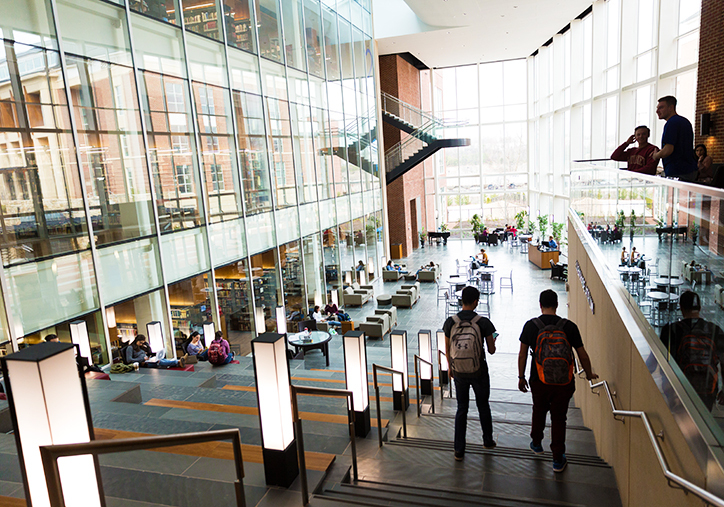 LIBRARY | Students use the learning resources and study areas at the Jerry Falwell Library. Photographed in February 2017. BOOKSTORE | Original bookstore at Lynchburg Baptist College. Photographed in March 1976. BOOKSTORE | Students line up outside the campus bookstore for an autograph signing of "The IF in Life" with Rashad Jennings, former NFL running back and Liberty alumni. Photographed May 2018. Through those founding years, students and faculty were inspired to influence the moral and ethical course of America. 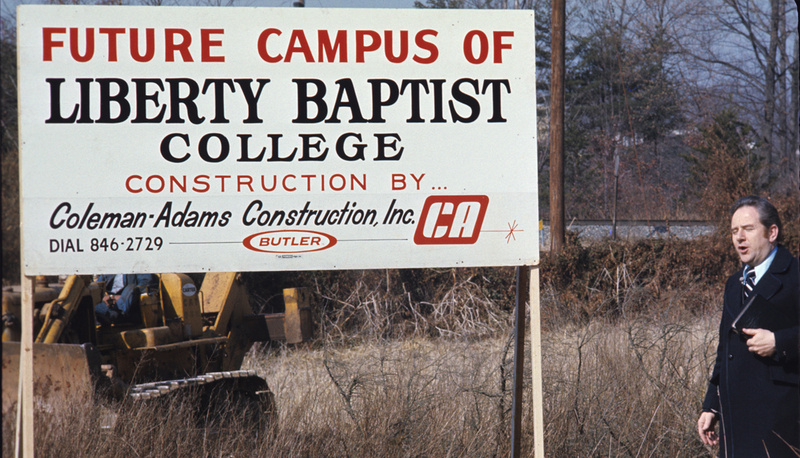 Subsequently, the school’s name officially changed to Liberty Baptist College in 1976 and the colors were changed to red, white, and blue. The college achieved full accreditation with the Southern Association of Colleges and Schools Commission on Colleges in 1980. 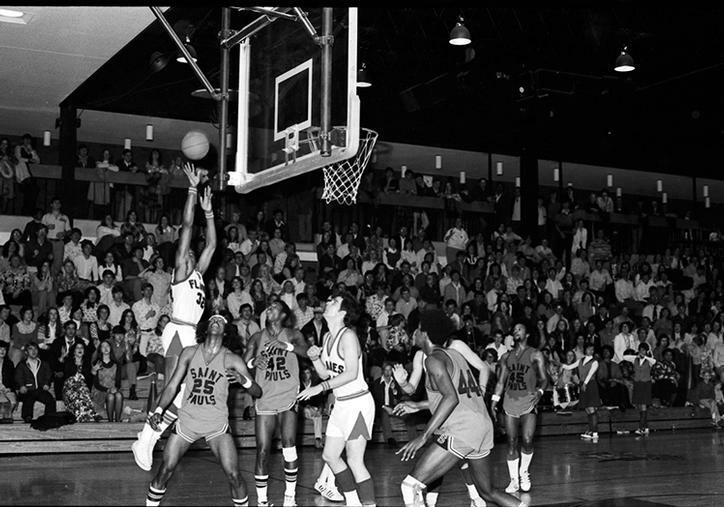 By 1985, the school had become recognized as a fully­ accredited university, adding programs and garnering recognition from both mainstream culture and the world of academia. 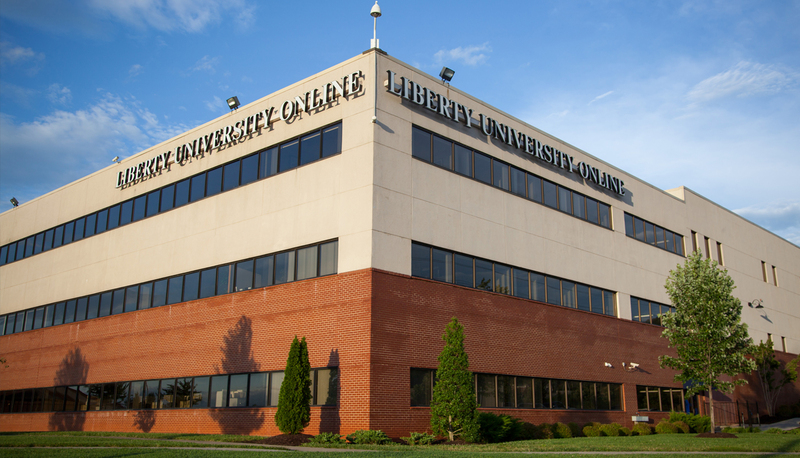 Liberty also pioneered a distance learning program that year, launching what is now known as Liberty University Online. Liberty’s journey has been one of facing giants, making the impossible possible, watching fervent prayer move mountains, and Training Champions for Christ. Standing on the shoulders of more than two millennia of Christian scholarship, Liberty University emphasizes the pursuit of knowledge in every discipline. A world-class liberal arts university with 17 schools and colleges, Liberty offers more than 600 programs from the certificate to the doctoral level ranging from medicine, biology, chemistry, and engineering to design, music, religion, law, and more. 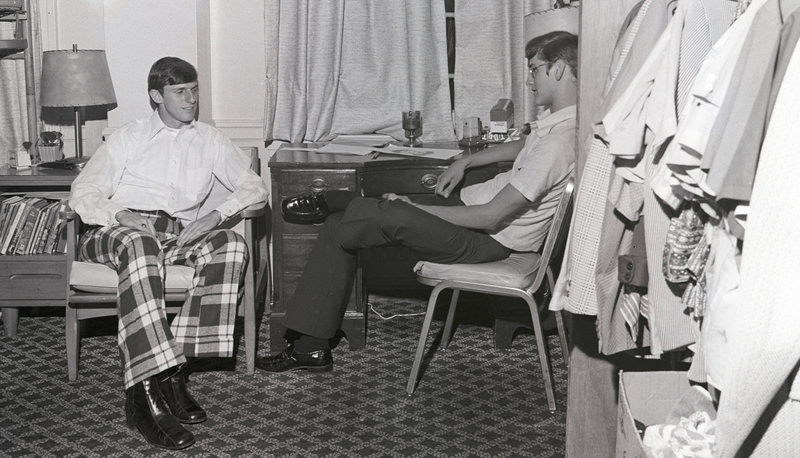 Founded in 1971 in Lynchburg, Va., Liberty has grown from a small college of 154 students into a university with a residential student body of over 15,000. Preparing students to be doctors, educators, ministers, lawyers, aviators, counselors, engineers, and more, Liberty is committed to developing tomorrow’s leaders — men and women of character whose impact will extend beyond their professions to change the world around them. 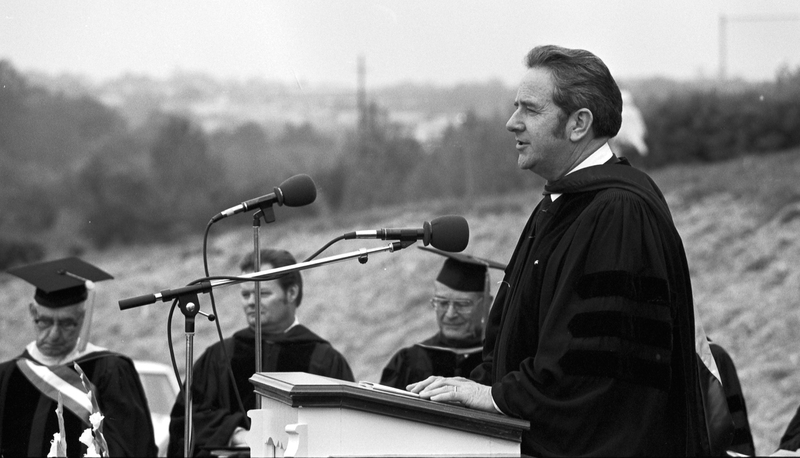 In 1967, Falwell implemented his vision to build a Christian educational system for evangelical youth. 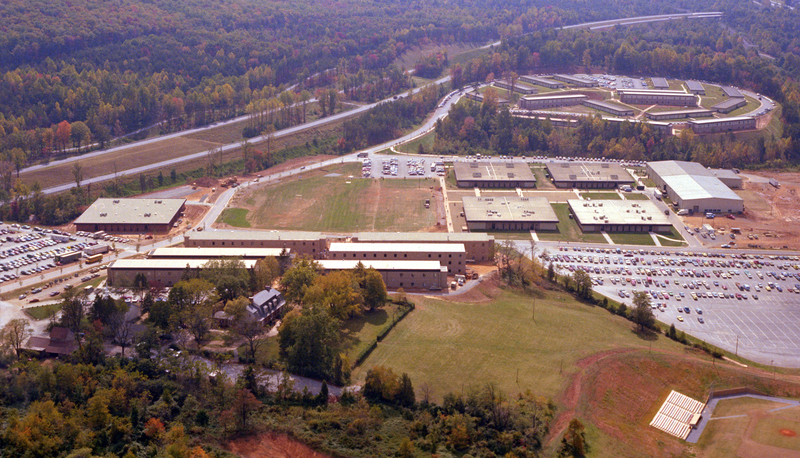 He began with the establishment of Lynchburg Christian Academy, an accredited Christian day school for grades K-12 . In 1971, he founded Liberty University, an accredited Christian university for evangelical believers. 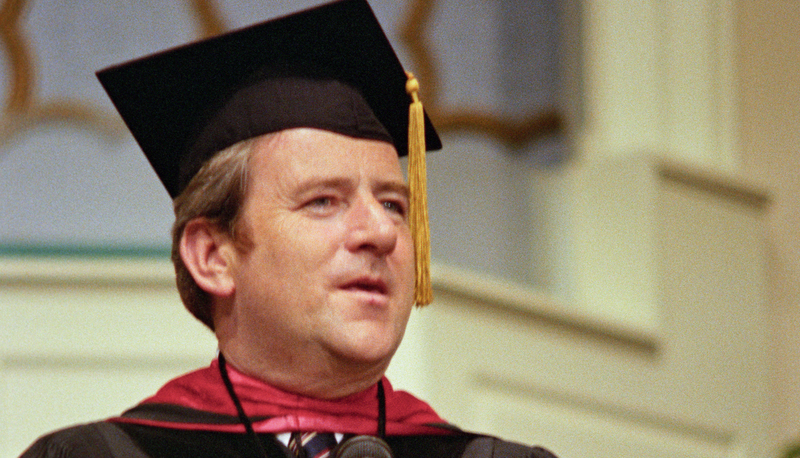 In 1985 Falwell announced his goal of 50,000 students. 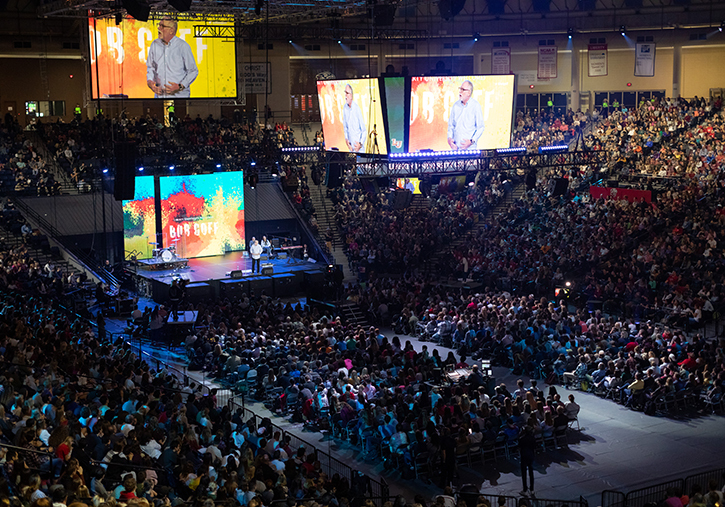 Today his vision has been fulfilled, with more than 15,000 students attending classes on campus in Lynchburg, Va., and more than 94,000 students taking courses through Liberty University Online. Lynchburg Baptist College is founded. 154 students are enrolled at a tuition of $200. The first section of Liberty Mountain is purchased for $1.25 million. 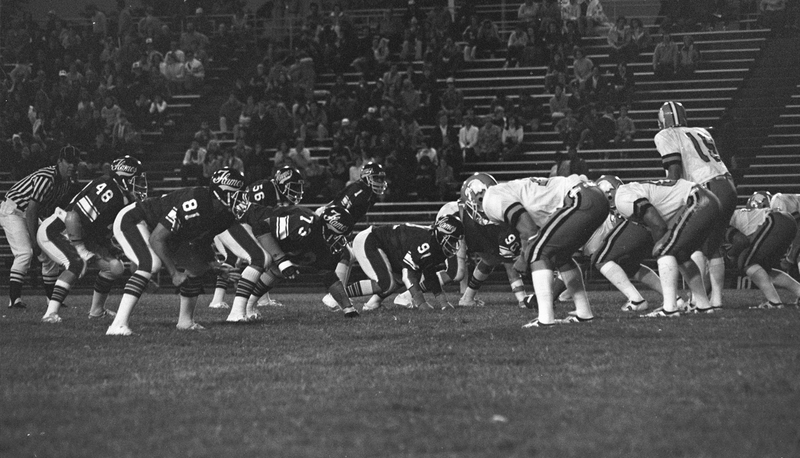 "Flames" is chosen as the football team name. Green and gold are chosen as the school's official colors. "Knowledge Aflame" becomes the official motto. Lynchburg Baptist Theological Seminary is founded. 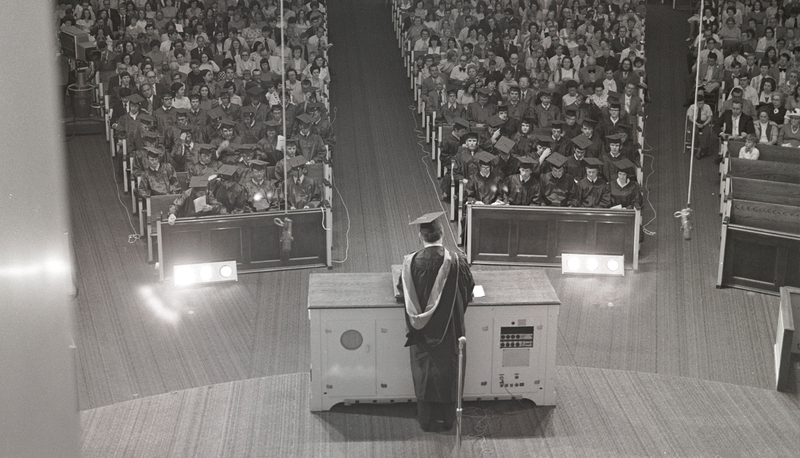 On May 22, 1974, the first graduation is held with Dr. J. Harold Smith as the first commencement speaker. 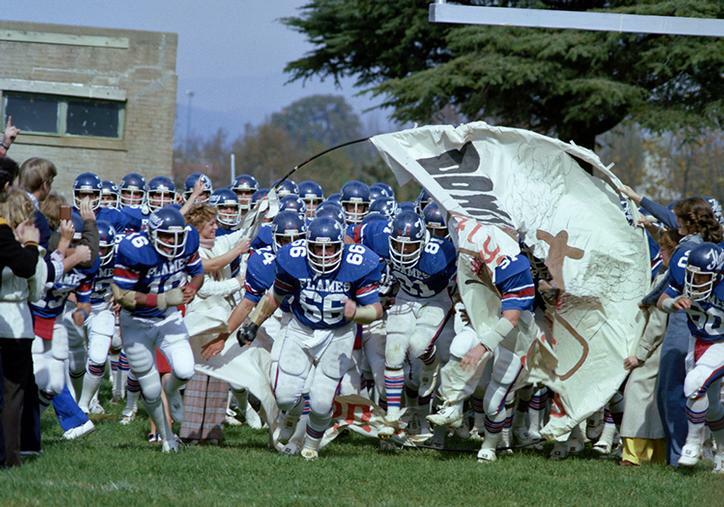 School colors are changed from green and gold to red, white, and blue. The Liberty Bell is unveiled. Lynchburg Baptist College becomes Liberty Baptist College. 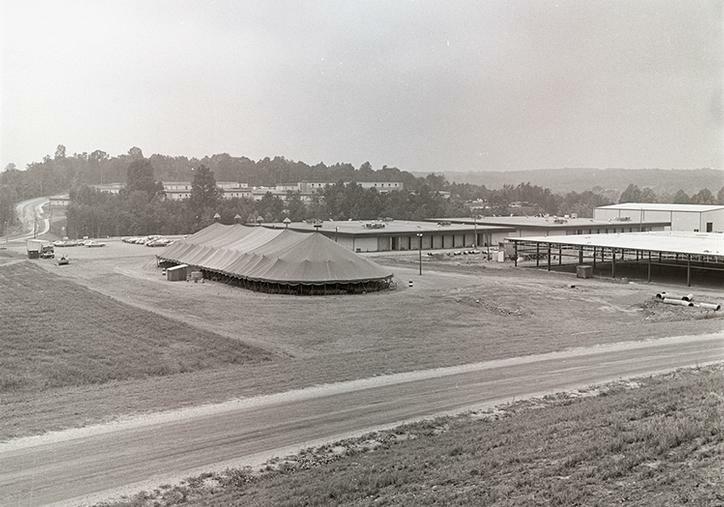 On May 7, 1978, during the college’s fifth graduation, 4,000 people gather for the first-ever commencement held on the mountain. This commencement becomes known as the "Convocation of Champions." 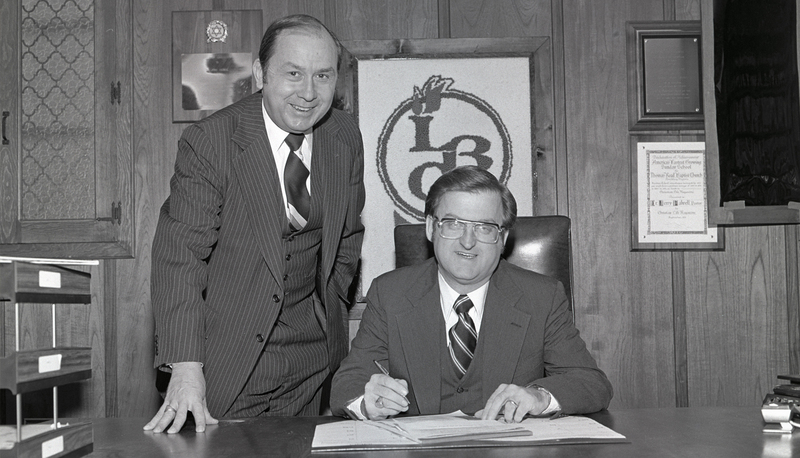 On December 17, 1980, Liberty Baptist College receives full accreditation as a liberal arts college by the regional accrediting agency Southern Association of Colleges and Schools. 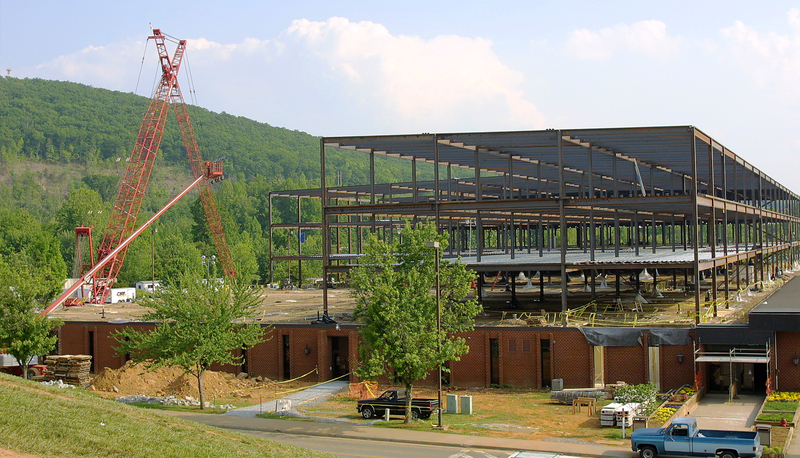 10 years after its foundation, enrollment at Liberty Baptist College is 3,528. Tuition costs $1,600. An associate program begins and 34 majors are offered. 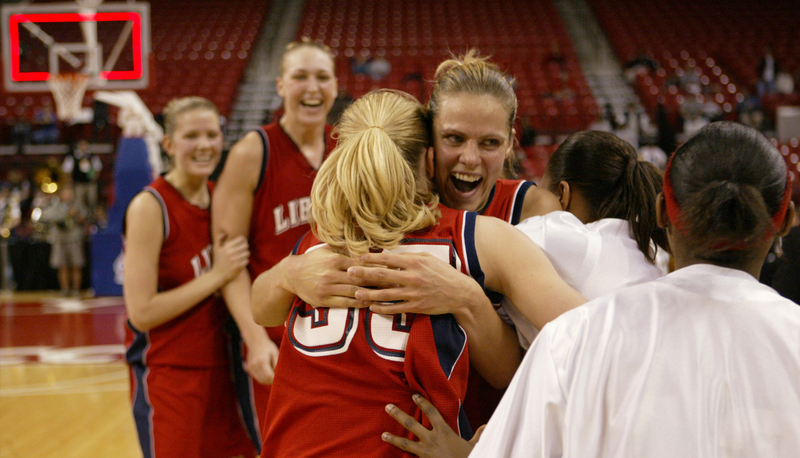 In January, Liberty Baptist College gains full acceptance into the NCAA. 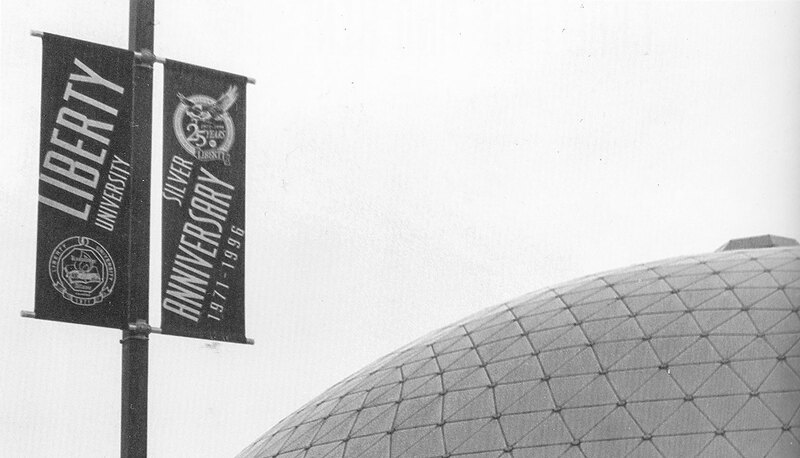 On May 6, 1985, Liberty Baptist College becomes Liberty University. The distance learning program, now Liberty University Online, begins as the Liberty University School of Lifelong Learning. 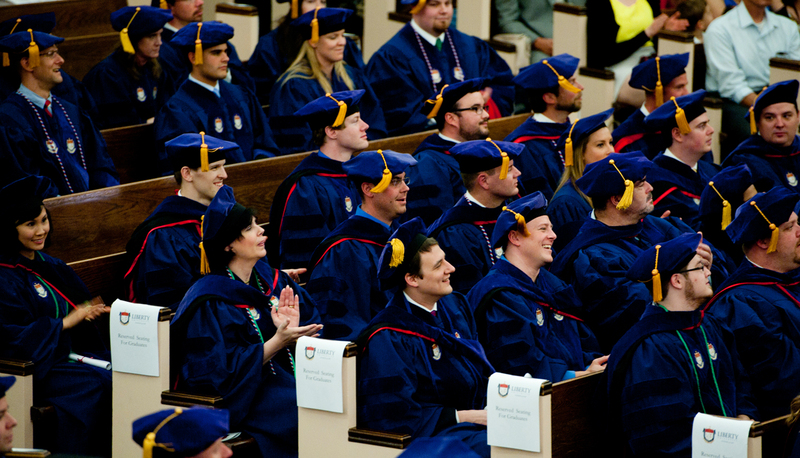 Liberty University offers its first graduate degrees, a Doctor of Ministry and a Master of Business Administration. 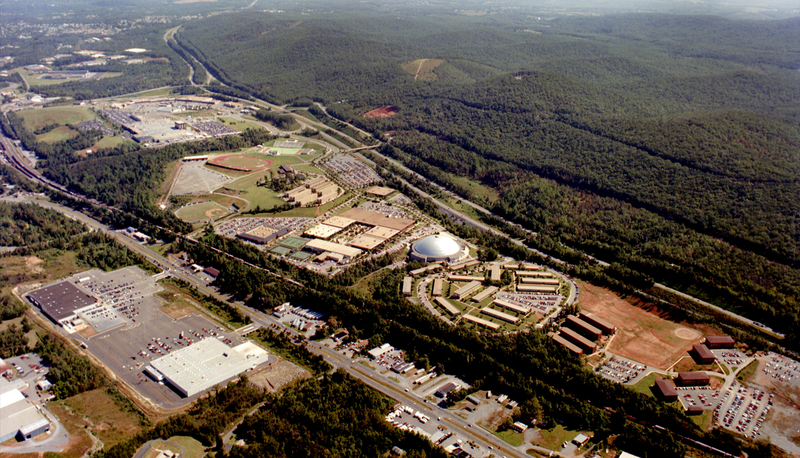 Liberty University becomes the largest private university in Virginia. Combined enrollment includes 11,000 students from all 50 states and 30 nations. Vines Center and Williams Stadium are completed. Reber-Thomas Dining Hall is completed. 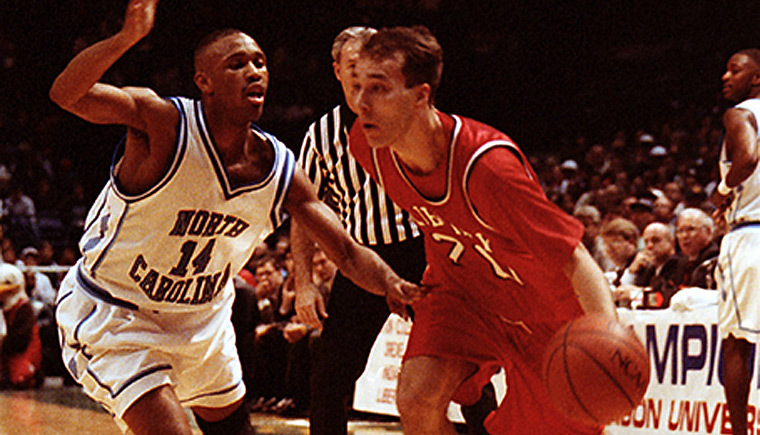 Men’s basketball play in Liberty University’s first NCAA athletics tournament. 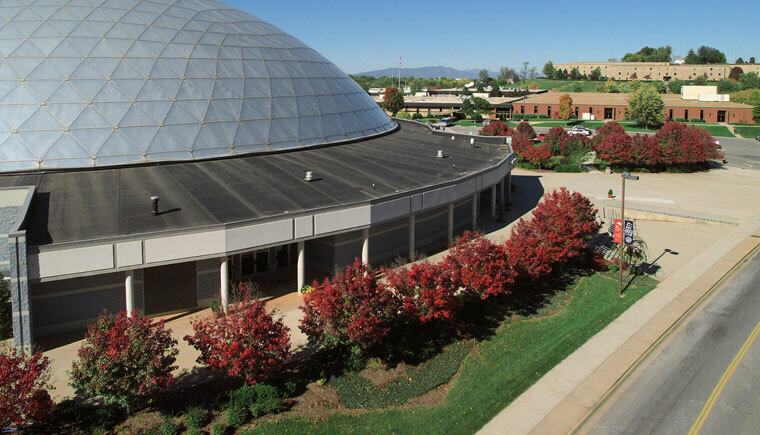 Two major benefactors purchase $30 million and $40 million of Liberty University’s debts, respectively. Liberty’s Silver Anniversary. A hardback commemorative book, "Twenty-Five Years of Miracles," is published, featuring stories and images from Liberty University’s 25-year history. 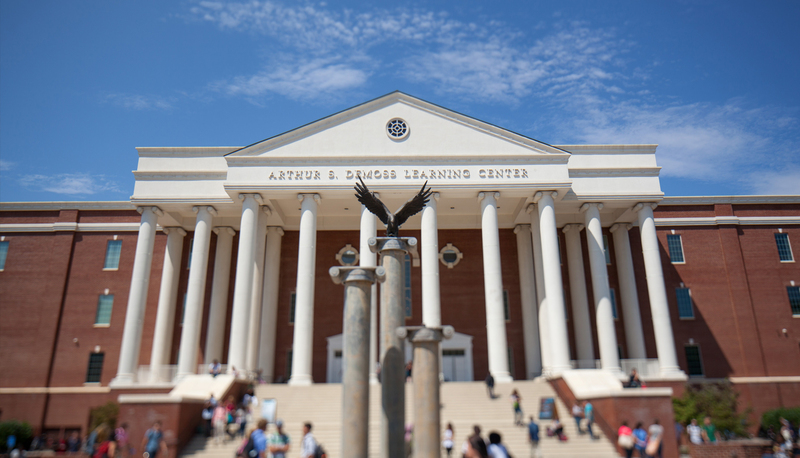 An anonymous gift of $9 million is donated to Liberty University to be used in the construction of three additional floors to DeMoss Hall. 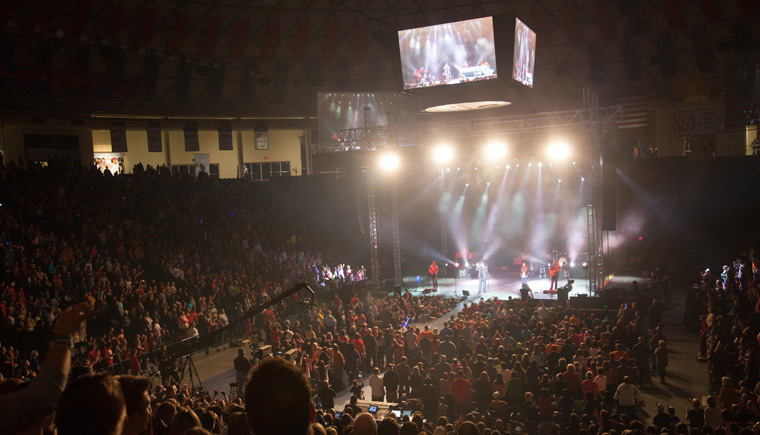 At Liberty University's first-annual Winterfest, more than 5,000 people attend and over 250 decisions for Christ are made. 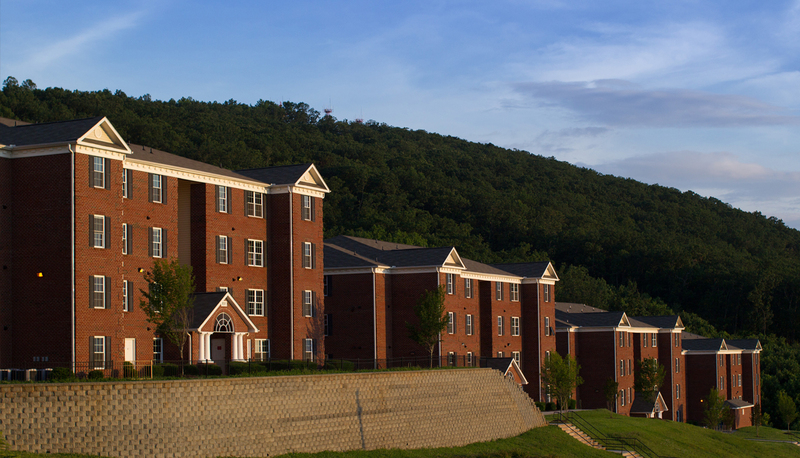 The East Campus dorms are completed. The second, third, and fourth floors of DeMoss Hall are completed. Marie F. Green Hall is donated by Hobby Lobby and the Green family. The men's and women's basketball teams win the Big South Conference tournaments for the first time in the same year. The 450-foot-long pedestrian tunnel running under U.S. Route 460 is completed. The women's basketball team goes to the NCAA Sweet 16 tournament. 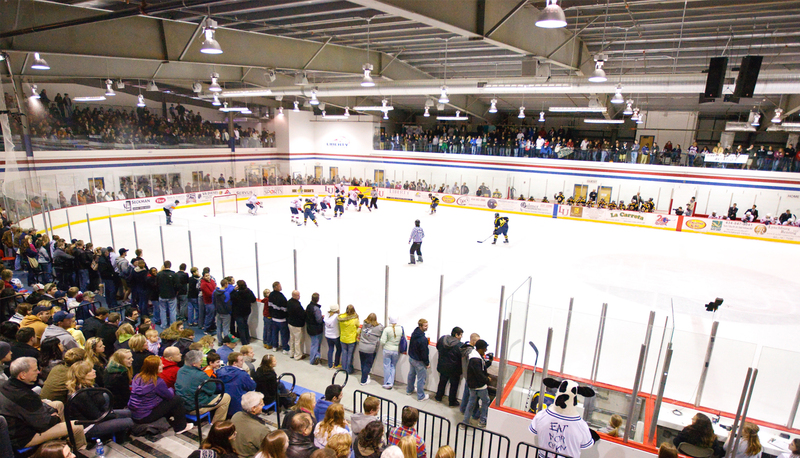 LaHaye Ice Center opens. 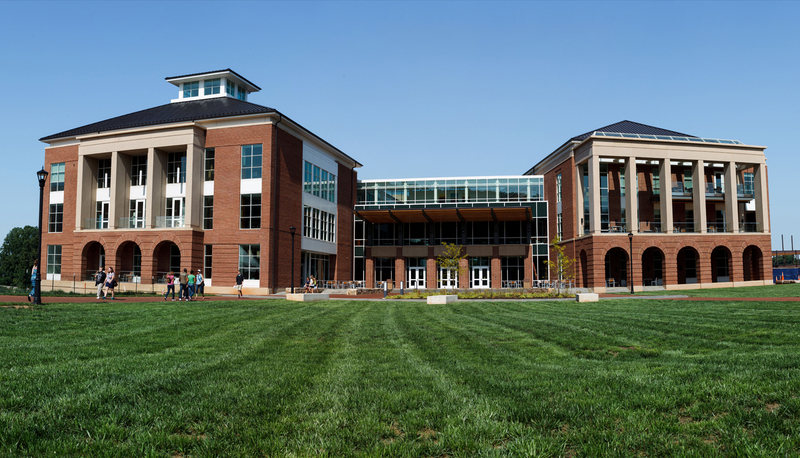 Liberty University’s Debate Team ranks No. 1 in the nation. 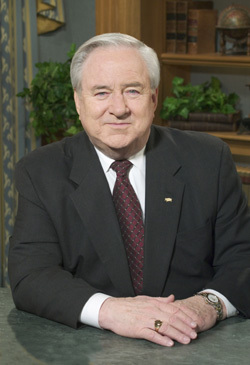 Chancellor and Founder Dr. Jerry Falwell dies on May 15, 2007. 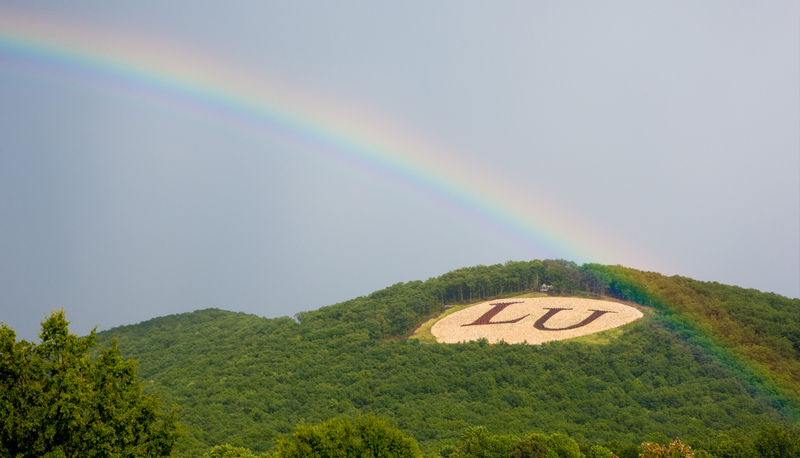 The "LU" monogram is put on Candler's Mountain. Liberty University's distance learning program is now known as Liberty University Online and tops 20,000 enrolled students. 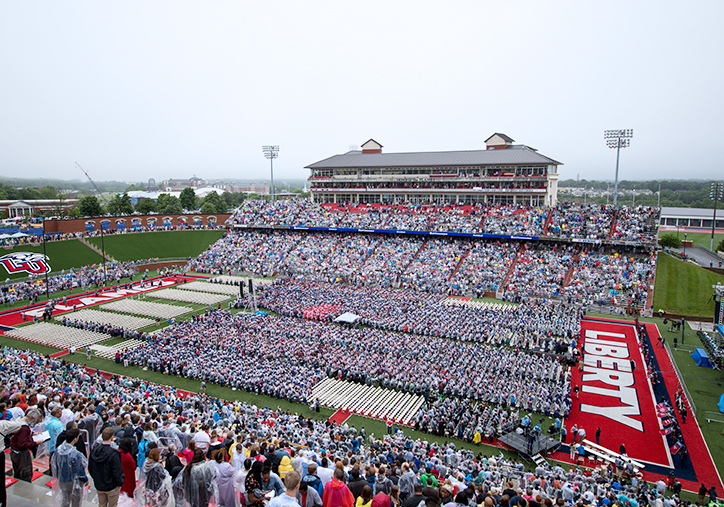 Liberty University has its first graduating class from the School of Law. The third floor of DeMoss Hall is renovated and opened for student use. 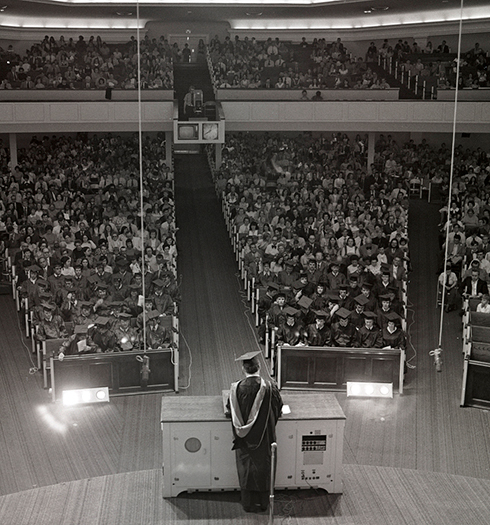 The Towns-Alumni Lecture Hall, an expansion to the B.R. Lakin School of Religion, is completed. 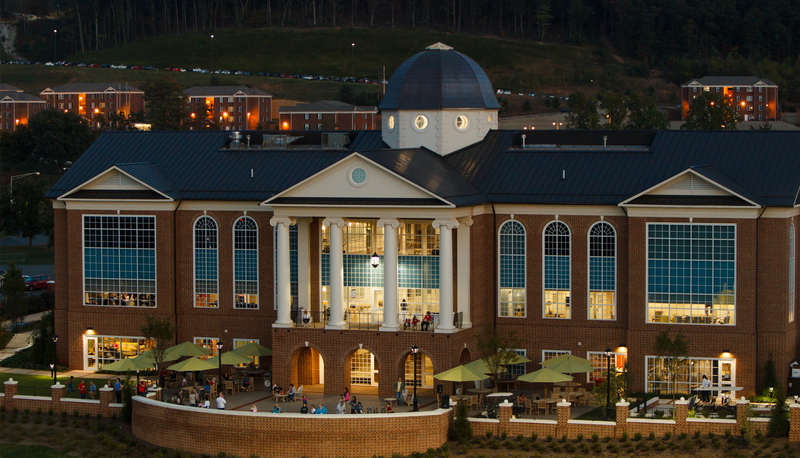 Liberty University receives the highest accreditation level VI from the Southern Association of Colleges and Schools. 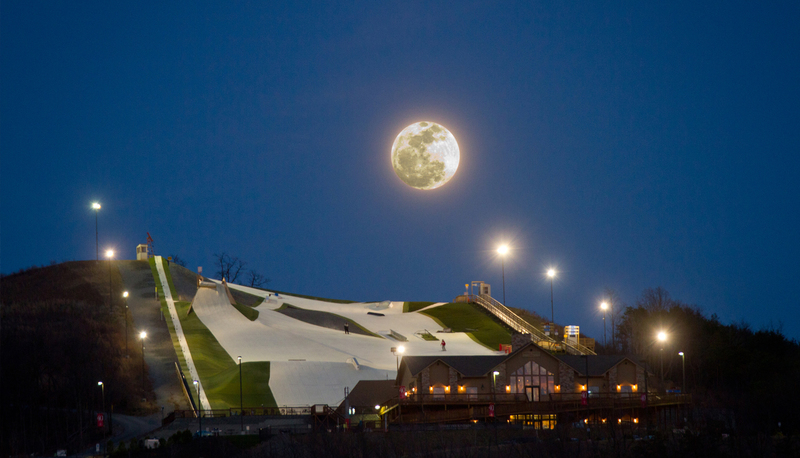 Construction is completed on the Liberty Mountain Snowflex Centre. 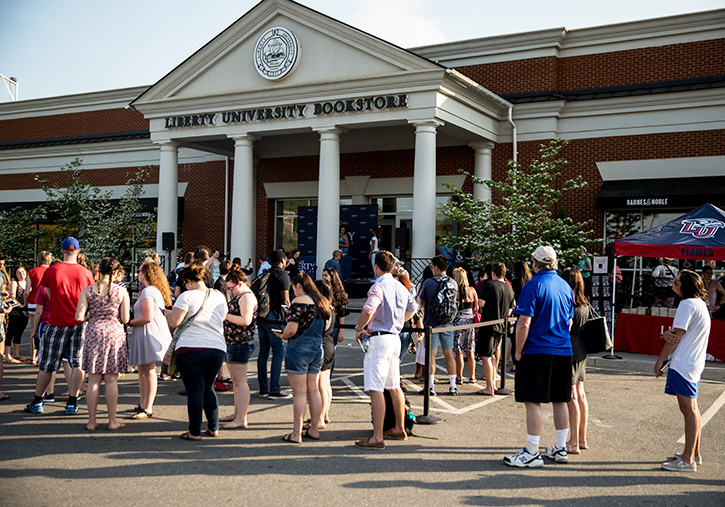 The new freestanding Liberty University Barnes & Noble Bookstore is opened on Main Campus. 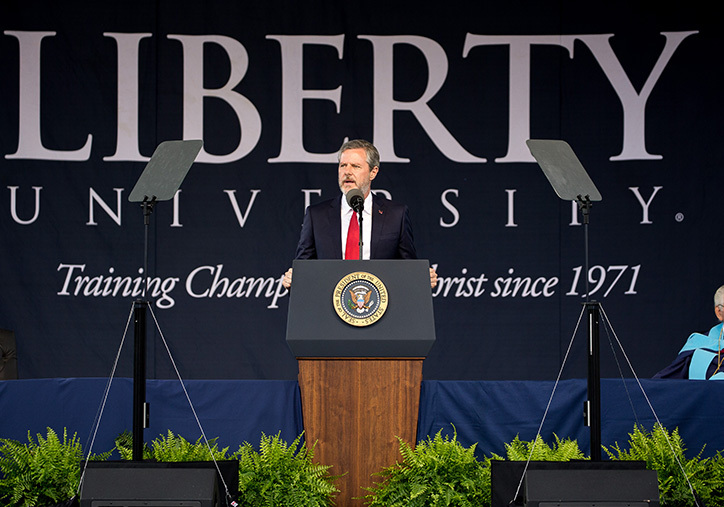 Liberty reached Dr. Falwell's goal of 50,000 enrolled students. Receives AA bond rating from Standard & Poor's. Liberty named among top 10 conservative colleges in the U.S. The expansion of Williams Stadium was completed. 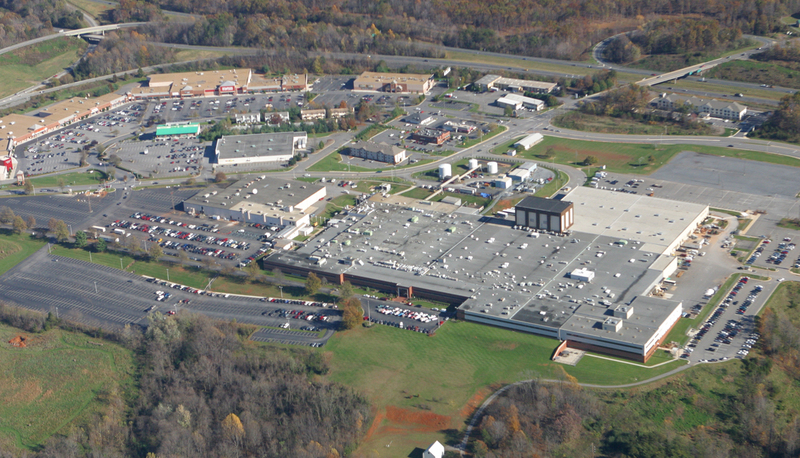 The School of Aeronautics purchased Falwell Aviation. Tower Theater at Green Hall opened. 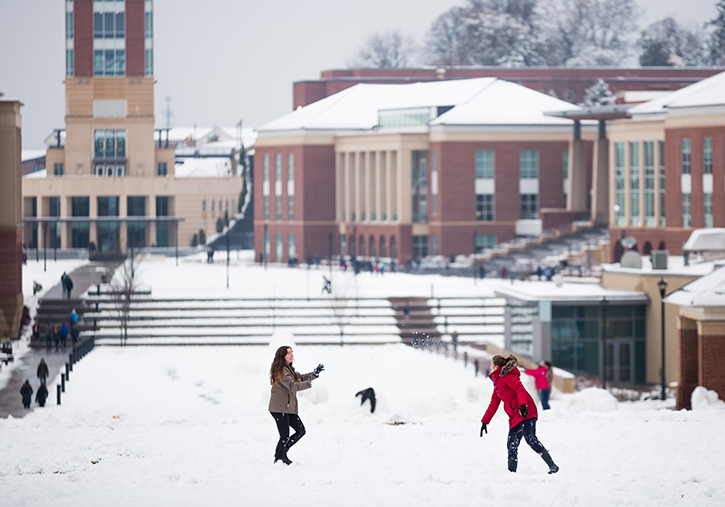 Liberty University becomes the nation's eighth-largest four-year university according to the U.S. Department of Education. 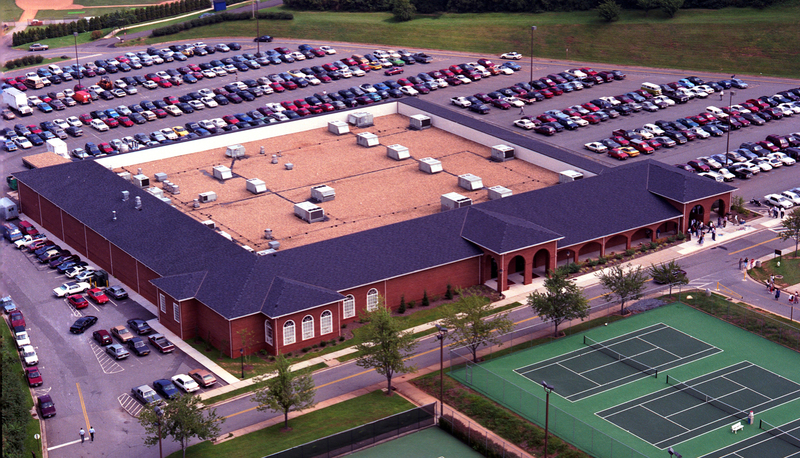 Liberty is gifted The Sports Racket, located 15 minutes from campus. Construction on the Wards Road pedestrian bridge is completed. The Equestrian Center on Liberty Mountain opens. Hancock Welcome Center is constructed. Groundbreaking for the Jerry Falwell Library begins. First voting precinct is held on campus. Enrollment exceeds 100,000 students. Liberty University launches a rebranding effort. Film partnership with Kirk Cameron is announced. Sears building is purchased at River Ridge Mall for $6.9 million. 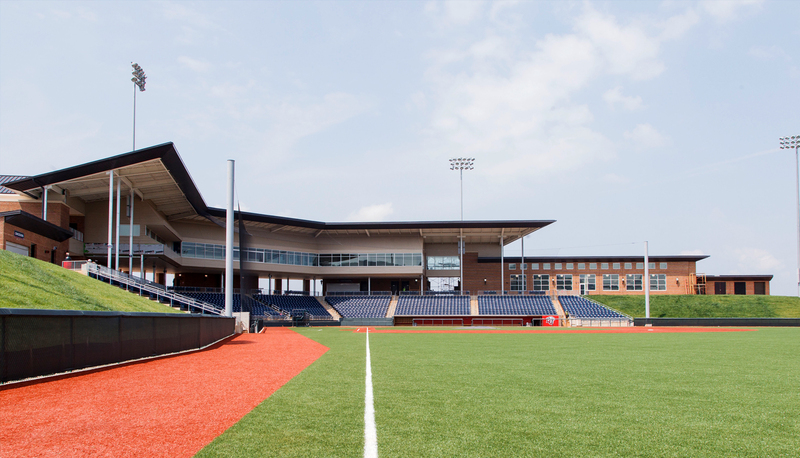 Liberty Baseball Stadium, Vines Center basketball practice facility, and football practice fields are completed. 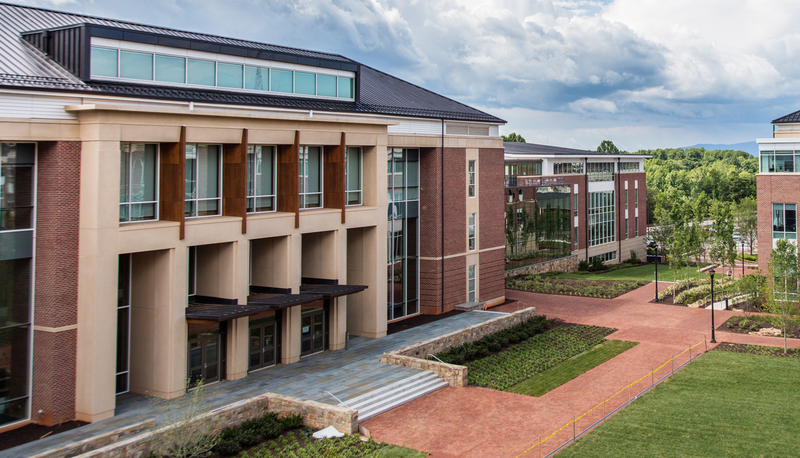 Jerry Falwell Library, Center for Medical and Health Sciences, first Residential Commons, LaHaye Student Union expansion, Vines Center upgrade, and vehicular tunnel are completed. Law School celebrates 10 years. College of Osteopathic Medicine welcomes its first class. Men's indoor track wins 17th straight conference title. The Flames take their first trip to the playoffs. 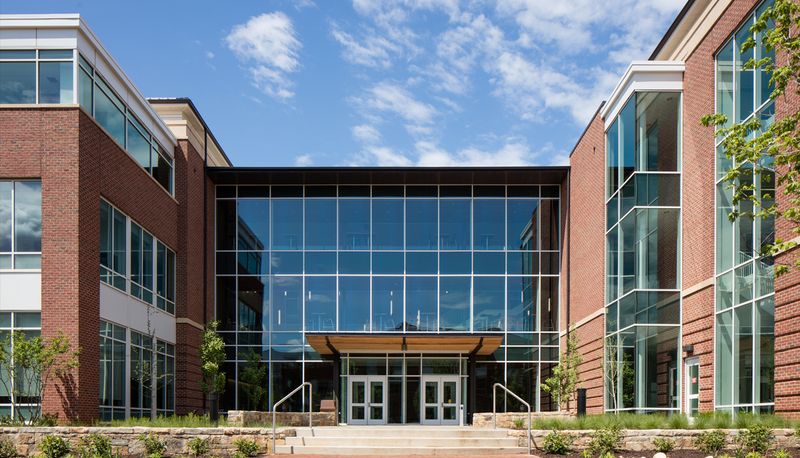 The Science Hall, new School of Music building, expanded LaHaye Ice Center, second Residential Commons, and Kamphuis Field at Liberty Softball Stadium open. Ground is broken for the Liberty Athletics Center and DeMoss Hall expansion, as well as Freedom Tower, home to the newly named Rawlings School of Divinity. LU Send Now humanitarian relief program is introduced. 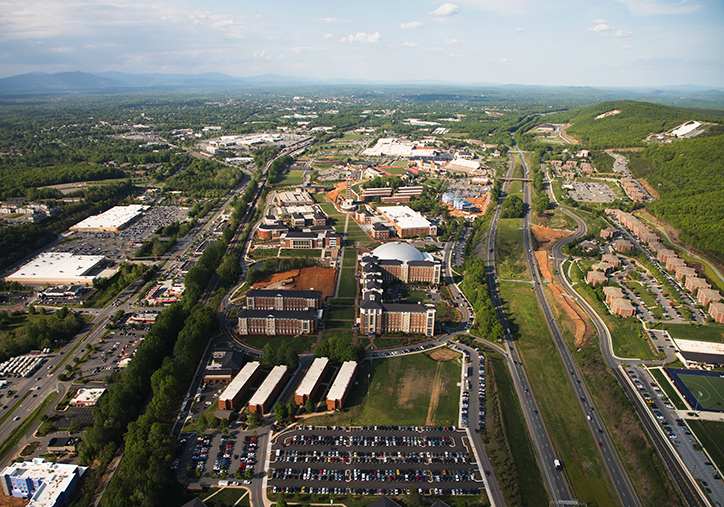 Carnegie ranks Liberty University as a Doctoral University. Liberty hosts the Virginia Commonwealth Games. Center for Applied Research & Scholarship is created. New London Airport is acquired. Ground is broken on the Indoor Football Practice Facility, Indoor Track Complex, and Natatorium. 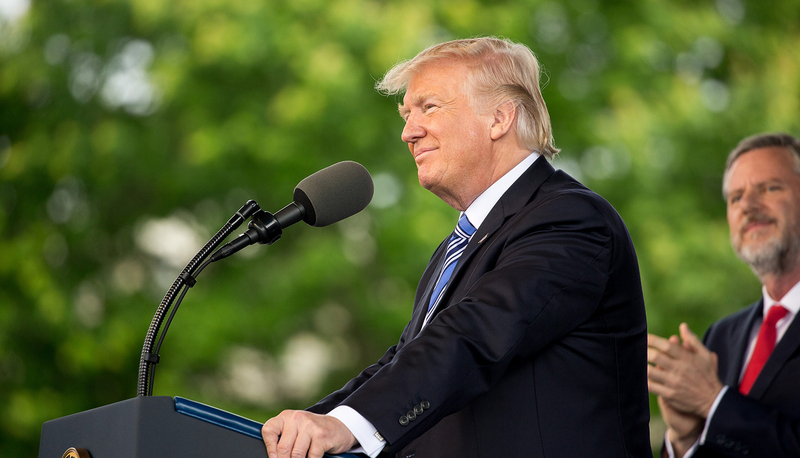 U.S. President Donald J. Trump delivers the first commencement address of his presidency to the class of 2017 and a crowd of 50,000. The NCAA approves Liberty University's waiver request for the Football Bowl Subdivision reclassification process. 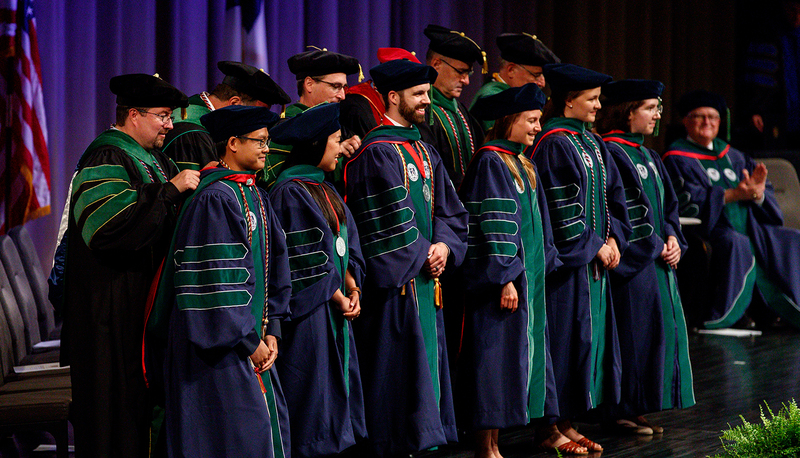 The Liberty University College of Osteopathic Medicine holds its first-ever hooding ceremony for its inaugural graduating class. President Jimmy Carter delivers the commencement address to the class of 2018. 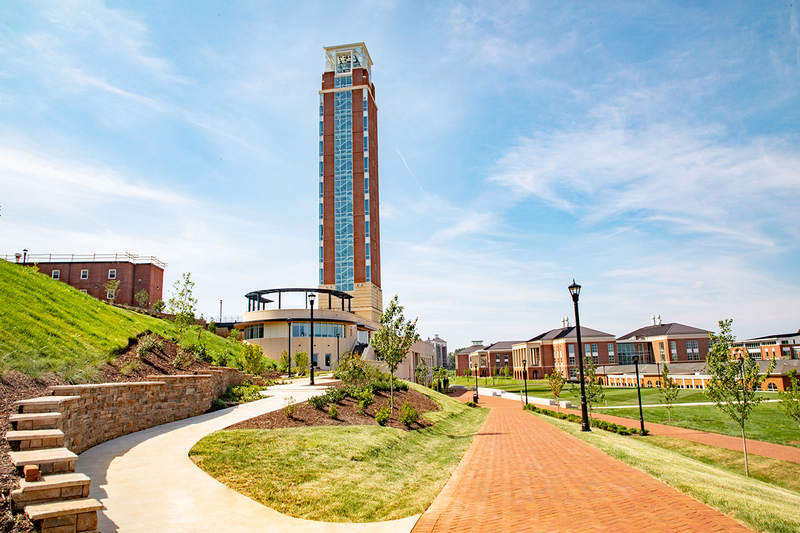 The Freedom Tower, the new home to the Rawlings School of Divinity, is completed. "From the beginning, the goal was not to create another Bible college. The vision was to create academic excellence, world-class facilities, NCAA Division I athletics, and student activities, and to provide it all with a distinctively Christian environment."